Once you have your dog comfortably walking on the treadmill, you can start thinking about what the specific goals are for your dog. Possible goals may include weight loss, endurance, strength, cross training, or behavioral modification. Goals may also be a combination of the all of these. Safety must always be the first consideration. 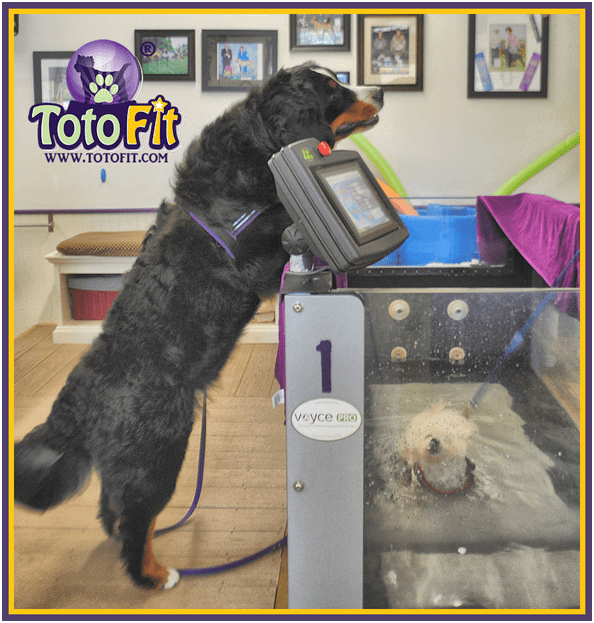 Your dog should be comfortable on the treadmill as discussed in the first part of this blog. In addition, your dog should never be left alone in the room on the treadmill and should be supervised. The dog should have a harness on for you to grab hold of, if necessary, and to attach the safety clip if your treadmill has one. When doing endurance work, the dog may be on the treadmill for 30+ minutes. This is a great time for you to catch up on that book you have wanted to read, work on the computer, or to take up knitting! WEIGHT LOSS is always difficult with dogs and weight reduction requires a combination of time, caloric reductions, and exercise. The American College of Sports Medicine recommends that people have 150 to 250 minutes per week of moderate intensity exercise for modest weight loss and more than 250 minutes per week for significant weight loss. Of course, this is for people, but we may deduce dogs require a similar plan. Ideally, exercise for thirty or more minutes a day is a great start for weight loss. There are many factors to consider with this, however. Dogs may be overweight secondary to musculoskeletal or orthopedic issues and this must be considered. As always, it is important to have your dog evaluated by your veterinarian prior to beginning an exercise program. In addition to musculoskeletal problems, metabolic, cardiac and other systems should be evaluated. Outdoor walking is a wonderful way to exercise both you and your dog, but it may not always be possible [If you are a Pokeman Go player, check out our Toto Fit Go Contest on Facebook!!]. Hot weather keeps canine fitness training inside in the summer, as does the extreme cold in the winter. So treadmill walking is a great way to begin the process inside. If your dog has never been on a treadmill before, we want to start slow. Plan on five to ten minutes for the first session on a level surface. Speeds will vary according to the size of the dog but may begin any where from 1.0 mph to 2.0 mph, large dogs maybe even 2.5 mph for a brisk walk. Twenty percent of the time walked should be dedicated to a warm up. For example, if the dog walks for ten minutes, the first two minutes should be a slower speed or a warm up. This allows the body to warm up and prepare for exercise. Warm ups should be done at less than the walking speeds. After the warm up, the speed of the treadmill may be increased slightly. If the warm up speed was at 1.5 mph, the speed may be increased by twenty-five to fifty percent, or between 2.0 mph and 2.5 mph. This will be the exercising speed. If the total goal is ten minutes of walking, the speed should remain here for approximately six minutes. A cool down will then be done for two minutes. Warm up for 2 – Exercise for 6 – Cool down for 2. Of course, this is all assuming the dog is doing well and not having any problems. Signs of fatigue will include excessive panting, nail scraping, difficulty walking, coughing, or lack of interest. Weight loss will involve a gradual increase in activity. If all goes well with each walk, the time may be increased by twenty percent every three days. Variations in speeds may also be added to assist with the weight loss. STRENGTHENING goals for treadmill work will include work for the hindlimbs and the forelimbs. Incline work will focus more on the hindlimbs, specifically the hip, stifle and hock extensors. Or in other words, the hamstrings and gluteals. Many treadmills have an incline option up to ten percent. The higher the incline, the more difficult the activity. It is similar to us walking up a hill. As always, we want to begin with a warm up on the flat. Two to three minutes at a lower speed is a great start, and speeds may be between 1.5 and 2.5 mph. Once the warm up is complete, moving into a slightly faster speed for two to three minutes will further increase the blood flow to the area. For example, the speed may be increased to 2.0 to 3.0 mph. After this, the speed should be reduced to the warm up speed while the treadmill is placed in the incline position. When the dog is walking up the incline, the goal is for the dog to use each hindlimb independently. Time may include anywhere from five to ten minutes, depending on the dog’s ability and goal of the workout. After the incline, the treadmill should be reduced to a flat surface again and a gradual cool down should be performed. The cool down will involve walking on a flat surface for a few minutes and then speed reduced again for a few minutes. Decline work will focus more on the forelimbs and the iliopsoas eccentrically. Most treadmills have a decline angle up to five percent. Decline or walking down hill is more stressful on the body then up hill or incline work. The same principles should be followed as the up hill walking. We want to work with a warm up and then faster speed on the flat before moving the treadmill to a decline. Decline work should initially be performed for only a few minutes and you will be looking for a slow and controlled movement. You will be looking for slow and controlled movements without a break in the rhythm or change in footfall pattern. After the decline, this will also require a flat walking speed and a cool down. STRENGTH training may be performed as part of regular program three times per week. ENDURANCE work on the treadmill should be between twenty and forty minutes. This will also require a warm up of up to five minutes, and a cool down of up to five minutes. Always factoring twenty percent of the overall time for a warm up and a cool down is a good rule of thumb. Endurance activities should be at speeds involving a fast walk or a trot. Some dogs are much more comfortable moving at a trot than a fast walk. One of the more common problems I see are owners not moving their dogs fast enough to obtain a comfortable trot. Play around with the speeds to determine what works best – as shown in the video. Endurance work may be performed three to five times per week. Sometimes dogs need to be exercised to help with BEHAVIORAL ISSUES. Depending upon the dog, you may find walking ten to twenty minutes a day on the treadmill with an appropriate warm up and cool down will assist with behavioral activities. Anyone want to learn about the UWT [Under Water Treadmill] ?? I would like info on under water treadmill work……especially for rehab after shoulder surgery in villi get muscle &a tendon. ALso TPLO rehab. I’ve had a regular treadmill for my dog Millie for about 6 months now. She absolutely loves it but loves water even more, so would love to learn more about the UWT ones!